Four years ago the college pastor was putting together a trip and as one of the leaders in the ministry, he asked if I would like to go. The notes we passed during a class went something like this…. Pastor: You should come to the Philippines. Me: Can I go for half? I’m already back at work. Pastor: You only love half of Jesus. Me: I’ll ask my boss, but count me in. Fast forward five months and our group landed in Manila. Three or four of the days we spent running a preschool program for local missionaries so that they could attend Bible classes taught by pastors on our team. Oh the joy on those kids dirty faces as they came to see us each morning. We taught them songs, preformed plays, and colored with them. We just wanted them to know that God loved them and so did we. After class we would walk them home. But “home” was really broken down buildings without electricity or running water held together with salvaged materials. Kids were bathed in the streets as people hung around, gambled, or sold homemade goods. God gave us these days to prepare our hearts for what was to come. Next up: IT Tender Ministry– a feeding ministry for street children. Children that have been abandoned by their parents, who live under bridges and scrounge for trash they might be able to sell. Children that often use the money they’ve earned to buy glue to huff because it takes away the hunger and pain. We went one afternoon to share a Bible story and help feed a group of kids that would come for what would be the only hot meal they would receive that week. They were dirtier than I thought possible but they had smiles that lit up the room. They were overwhelmed with gratitude that we had come to play and hang out. The room was small and stuffy but filled with excitement. As I sat and spoke with one of the founders of the ministry, Gela, a little boy crawled onto my lap. I wrapped my arms around him and continued my conversation. I learned his name was John Michael, he was 6 years old and was part of a “family” of 6-7 kids. The oldest a teenager, the youngest a toddler. Together they took care of one another. When the ministry had visitors, this was his typical behavior. The food was eventually served but he refused to get up. I knew he was hungry, starving probably, but what he was really hungry for was love and physical affection from someone, anyone, a stranger even. He needed to be loved on if only for a moment. Numerous times I told him to go eat but still he refused. I stood and carried him to the table with his arms wrapped tightly around my neck. We sat and he ate, every once in a while looking up at me to make sure I was still there. I’d smile and he would return to his food and his friends. Before we left I asked Gela about adoption. My heart ached for this little boy. Gela said that because he was abandoned he had no official paperwork making it nearly impossible. Also, the corrupt government would add to the difficulty by constantly raising the price of adoption. I hugged him good bye and wrote his name down in my Bible. I pray for him often and wonder where he is, who he is, if he is experiencing the love of a parent or if he feels the ultimate love of Jesus. Hopefully when I get to Heaven I’ll find out. The day after the feeding ministry we went to the Children’s Ward at the local hospital. The government calls it a hospital but what it really is, is a large hot, muggy room, filled with beds and dying children. We heard their stories and saw their wounds as we walked around and prayed. Here, people only get medical care if they can pay for it. While they may be laying in a bed with the most rudimentary IV I have ever seen, they are not getting medicine or visits from a health care professional. Not until some pays upfront. And once they do, its up to the parent to administer the medicine or re-dress the injury. Honestly, I don’t have the words to fully explain what our group experienced that day. Hopelessness, frustration, anger, utter loss, confusion…. We all walked out of the hospital, loaded into the truck and sat. In silence. Even our most boisterous college girls had nothing to say. After about 15 minutes our college pastor broke the silence with passages from Revelation. Bottom line, he reminded us all, Jesus wins. God wins. This world is filled with darkness because of our sinful nature, but in the end Jesus will triumph. Amen, Pastor, amen. The trip went quickly–more visitations, time getting to know the missionaries, lots of food, beautiful rain storms, de-briefings with the team, all intermixed with quiet times with Jesus. And finally, the long trip home to my comfortable bed in my big house with running water, to my car and refrigerator filled with too much fresh food, to my big church that meets in a big building with bright lights, to my family and friends that support me in my walk with Jesus. Back to my simple, abundant life. It was hard to come home but I was so thankful to be back. My heart was changed there. And a piece of it stayed wrapped around John Michael. Jesus showed me more of His heart. His heart for the poor and oppressed, for the sick and needy, for the orphan. I still pray, almost four years later, that God will use this trip for His glory and that my heart will never go back to what it once was. 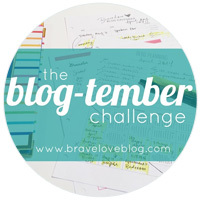 Today’s post is part of the Blog-tember series! Oh~amazing! I really want to do a service mission/trip and it sounds like you have done wonderful things! I was supposed to go to New Orleans after Katrina but ended up not leaving college to go and I deeply regret it! I loved hearing about your trip!